The Montreal Canadiens never took their foot off the gas pedal in an 11-goal thriller as the race to the playoffs intensifies. 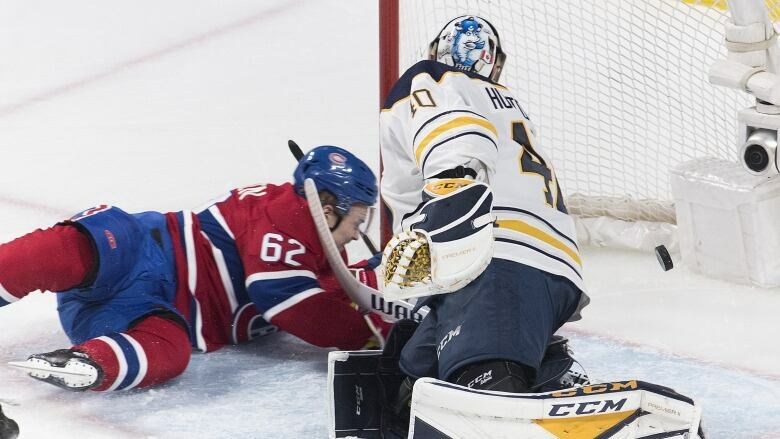 The Canadiens scored four goals in the second period and another three in the third to defeat the Buffalo Sabres 7-4 on Saturday night, extending Montreal's win streak to three games. Brendan Gallagher, Max Domi and Tomas Tatar each had three-point nights. "That's our team identity right there to be resilient and to be consistent," said Domi, who had a goal and two assists. "[Buffalo] is a really good hockey team. They have a lot of firepower up front, good defence, great goaltender. They weren't giving up and we knew that. We just found a way to keep going." Montreal (40-28-7) increased its lead to three points over the idle Columbus Blue Jackets for the second wild-card spot in the Eastern Conference. Columbus has a game in hand. Claude Julien's men squandered a two-goal lead in the second period as the Sabres came back to tie the game 3-3, but the Canadiens found another gear. Paul Byron gave Montreal the lead at 18:03 on a 2-on-1 with Jordan Weal, whose shot was saved by Carter Hutton before bouncing off Byron's skate and in. Gallagher made it 5-3 at 8:35 of the third period for his 33rd goal of the season before Jack Eichel got one back for the Sabres at 13:13. Domi sealed it with a power-play goal with 4:30 remaining in the encounter. Tatar, playing his 500th NHL game, added an empty-netter with 2:13 to go. The Canadiens have produced 14 goals on their current three-game win streak. "We gave up a couple of goals but our team did a great job responding," said Byron, who netted his 14th of the season. "In the third period, we didn't sit back, we kept chasing the game and trying to score. Huge two points for us. "We're fighting for the playoffs. Every game is pretty intense out there. It was a playoff atmosphere." The Sabres (31-34-9) were officially eliminated from playoff contention. They have one win in their past 10 games (1-8-1). "It's been a long year," said Eichel. "These same issues seem to continue to haunt us. We have to be better these next few games. There's still a lot of pride on the line. We represent our city, this organization. That should be enough right there. We should play for each other more."